If you’ve ever walked outside and breathed in the beautiful fresh air (especially if you happen to live in one of America’s cities known for its good air quality), you’ve probably never wondered what it might feel like to have to pay for every breath you take. For the 30 million American adults that have chronic obstructive pulmonary disease (COPD), 18 million with asthma, and nearly 6 million who’ve experienced heart failure, a deep breath of clean air can sometimes be hard without the help of oxygen therapy. To understand what breathable air costs for some Americans, we broke down the most common oxygen therapy options by price over time and compared the Inogen One G4 to other oxygen machines and dispensers. Continue reading to see what we learned. Of the six oxygen therapy and recreational oxygen options studied, the most casual solution to pay for oxygen also happened to be the most expensive. Oxygen bars – where people can breathe up to 30 minutes worth of oxygen to potentially increase their energy levels, cure headaches, or even extend their endurance – would quickly add up over time. 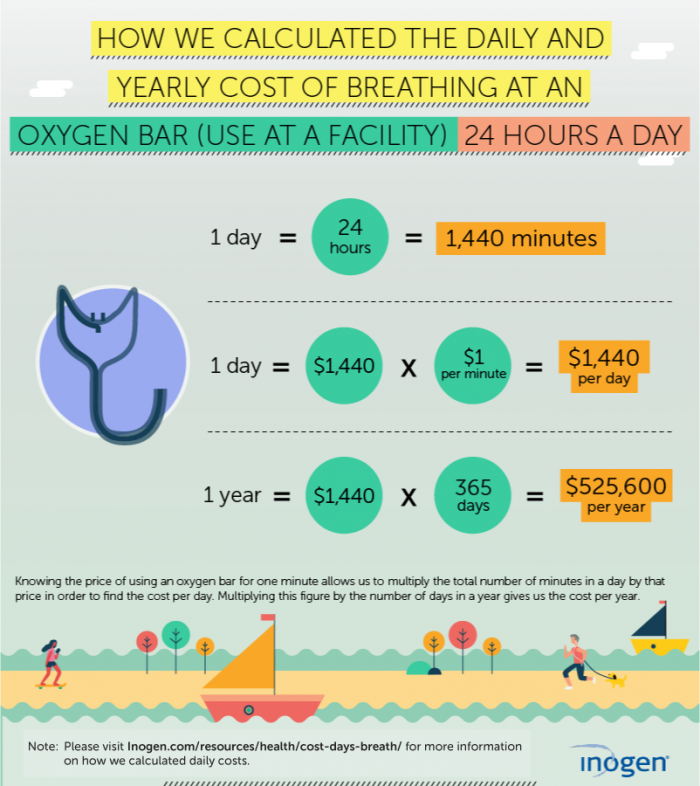 On average, the cost to use an oxygen bar would set you back more than $1,400 a day – adding up to roughly half a million dollars over the course of a year. Of course, there’s always oxygen in a can. 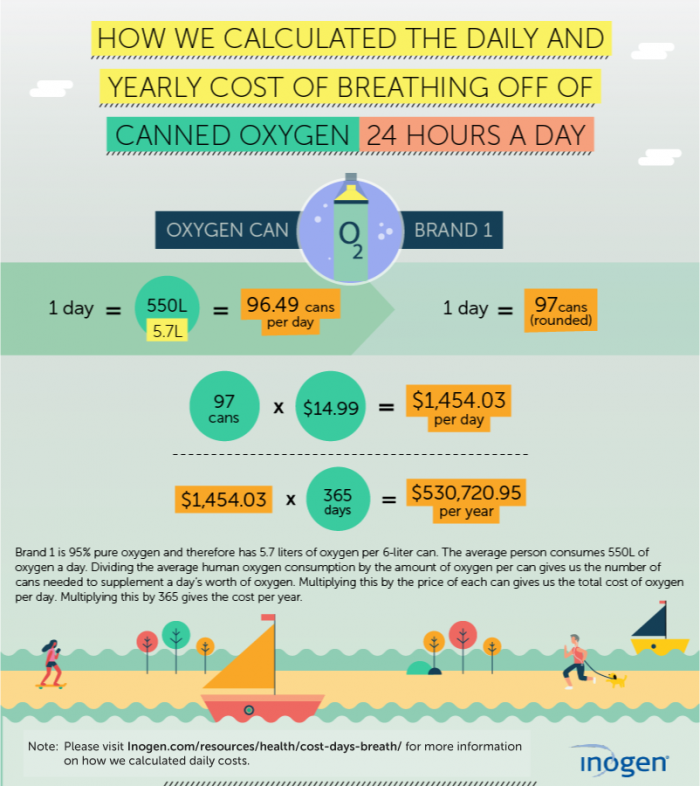 While there are similar proposed health benefits to an oxygen bar, the cost to use oxygen cans is still high. Daily use averages out to nearly $1,200 a day. Thankfully, for people who need long-term oxygen therapy, the daily cost of solutions like the Inogen One G4 is much lower in comparison. At less than $2 a day, the annual cost of an equally portable solution to breathing difficulties averages at around $700. Many of the millions of Americans who have COPD need to receive at least 15 hours of oxygen therapy each day, the use of which can dramatically improve their quality of life. While the benefits of recreational oxygen therapy may vary, the use of oxygen therapy for people with chronic breathing conditions (including COPD) are well-documented. Studies have shown that supplemental oxygen can increase exercise performance for patients with COPD, improve their sleep quality, and even increase people’s life spans. If you have a chronic (or even acute) breathing condition and your body isn’t getting as much oxygen as it needs to function properly, you may experience symptoms including rapid breathing, shortness of breath, coughing and wheezing, sweating, and confusion. 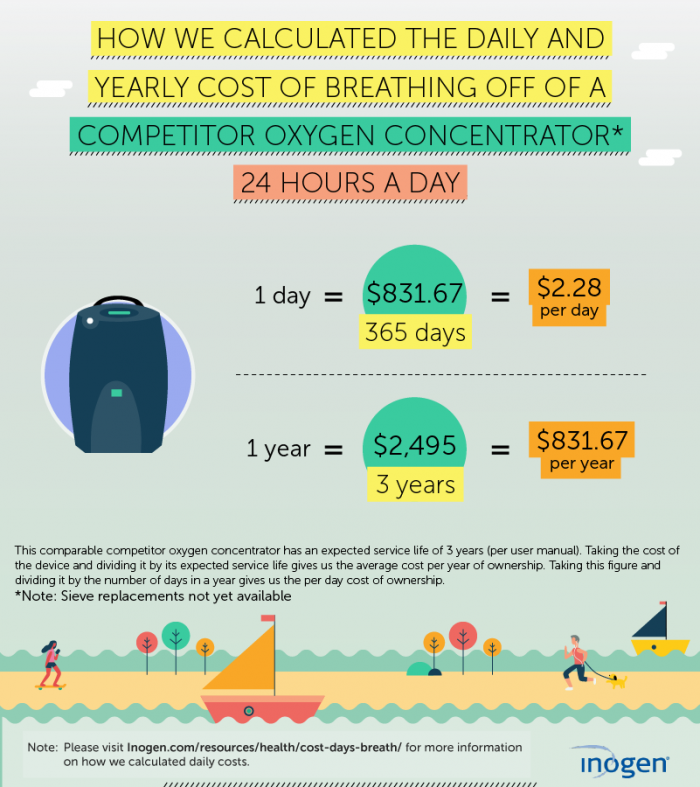 When comparing the Inogen One G4 to competitor oxygen concentrators, the long-term costs of the competitors were higher than the Inogen G4 oxygen system. While the cost of devices with a three-year warranty was essentially the same, the cost per day to power each device was significantly lower in the Inogen One G4, averaging $1.64 compared to $2.28. 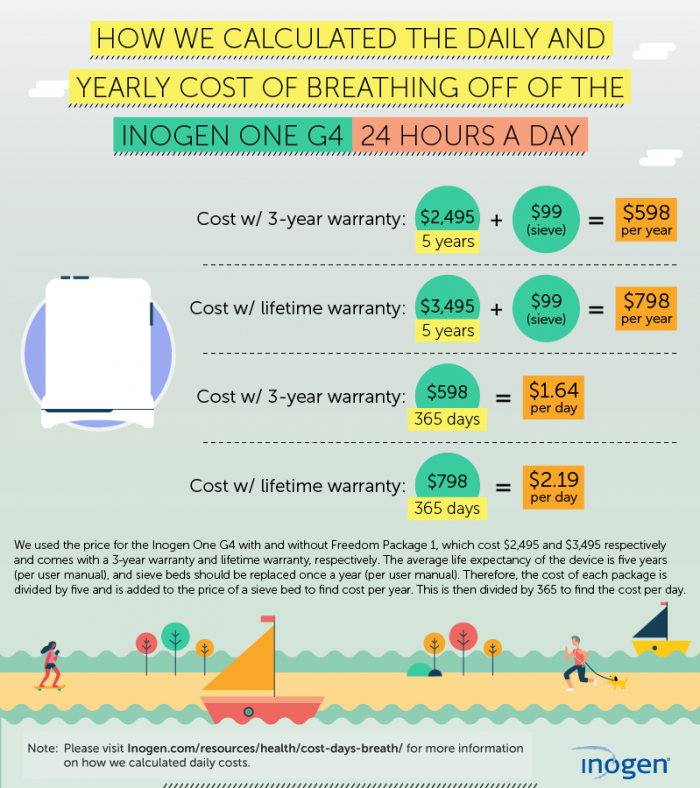 Purchasing an Inogen One G4 with a lifetime warranty may have a larger upfront cost, but its daily cost still averages to $2.19, making it a less expensive option than alternative oxygen concentrators. For the millions of Americans who might benefit from utilizing long-term oxygen therapy, there are two primary solutions to help supply the appropriate levels of oxygen: oxygen tanks and oxygen canisters. Oxygen tanks (including the E-Cylinder 679 L Capacity) and oxygen concentrators serve the same purpose for COPD patients – they supply oxygen to the blood through the use of a nasal cannula (or breathing mask) to reduce shortness of breath and increase energy levels. Even kidney function and memory loss may be improved with the proper use of oxygen therapy in some patients. Still, oxygen concentrators like the Inogen One G4 and oxygen tanks like the E-Cylinder 679 L Capacity offer different daily experiences and costs for the patients who use them. Tanks can be very large and bulky in their size, making them difficult to transport and travel with. They also have significantly higher daily costs. 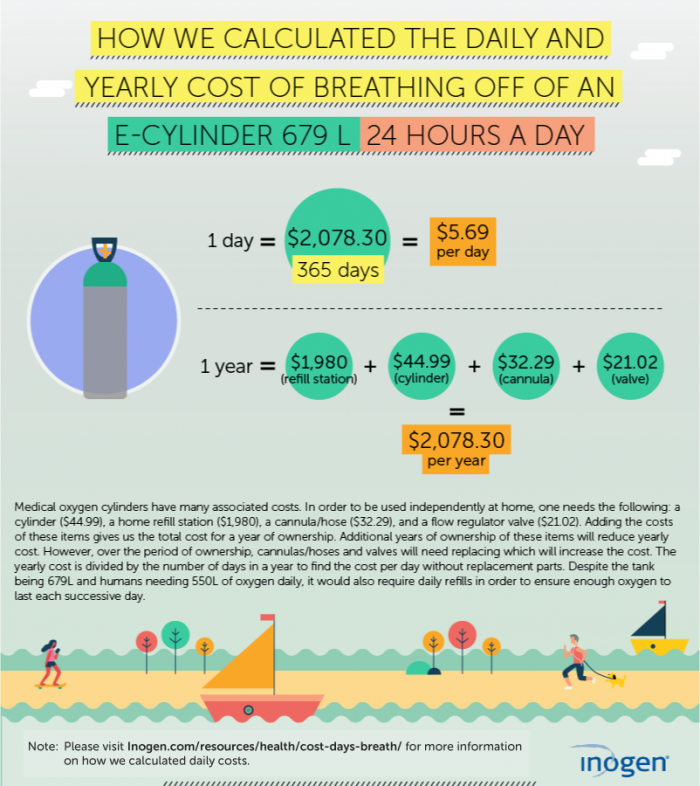 The E-Cylinder 679 L Capacity can cost an average of $5.69 per day, adding up to more than $2,000 a year. The Inogen One G4 with a lifetime warranty averages to only $2.19 per day, more than half the cost. If you have COPD, heart failure, or asthma, you probably wouldn’t consider carrying around a scuba tank to increase your air quality unless you had to. Still, the concept is virtually the same. For underwater divers looking to explore Earth’s hidden mysteries (or treasure), scuba tanks provide the air they need to survive at incredible depths. Unlike scuba divers, people with breathing conditions like COPD or heart failure use oxygen therapy systems to sleep better at night, live full and active lifestyles, and live longer while managing their conditions. Thankfully, the medical solution of an oxygen concentrator is much less expensive per day than the recreational use of a scuba tank. 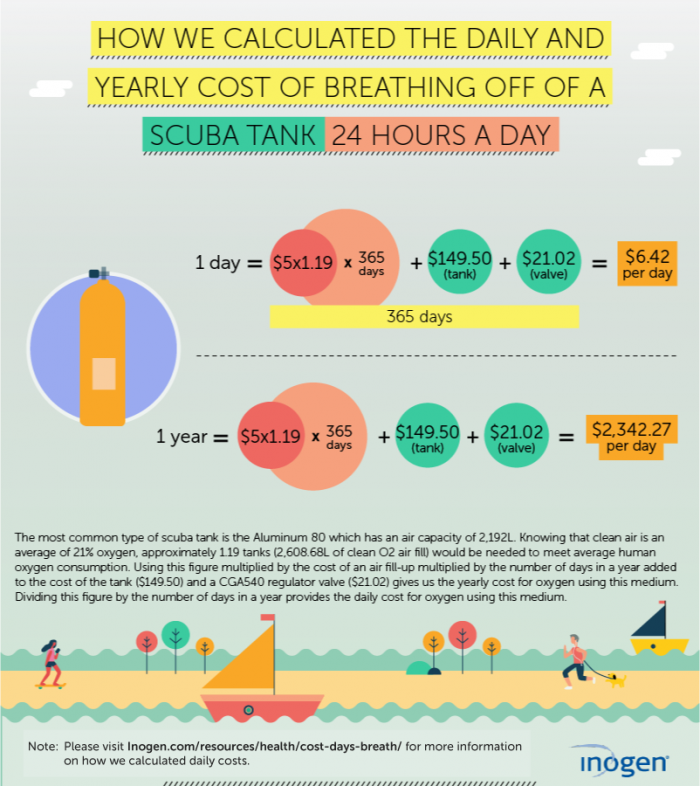 When you factor in the cost of refilling the tank, the accessories you might need for regular use, and mandatory replacement parts, using a scuba tank for oxygen would cost you over $2,300 a year, compared to $598 and $798 for a three-year and lifetime warranty on a Inogen One G4, respectively. As a bonus, the Inogen One G4 weighs just 2.8 pounds compared to the 30- to 35-pounds a diver’s tank can weigh. Most people wouldn’t turn down an opportunity to reduce their stress levels or feel more energized throughout the day. Recreational oxygen therapy promises to do just that by increasing your oxygen intake from 21 percent to 35 to 40 percent. Medical experts don’t exactly agree with the claims oxygen solutions like canned air promise, though. Unless you happen to be an athlete who pushes your body to its limits, the added oxygen might not do anything to help your body at all. On average, canned oxygen costs just under $50 a unit – a cost that would exceed $1,160 per day if you relied on it for constant use, and more than $426,000 a year. 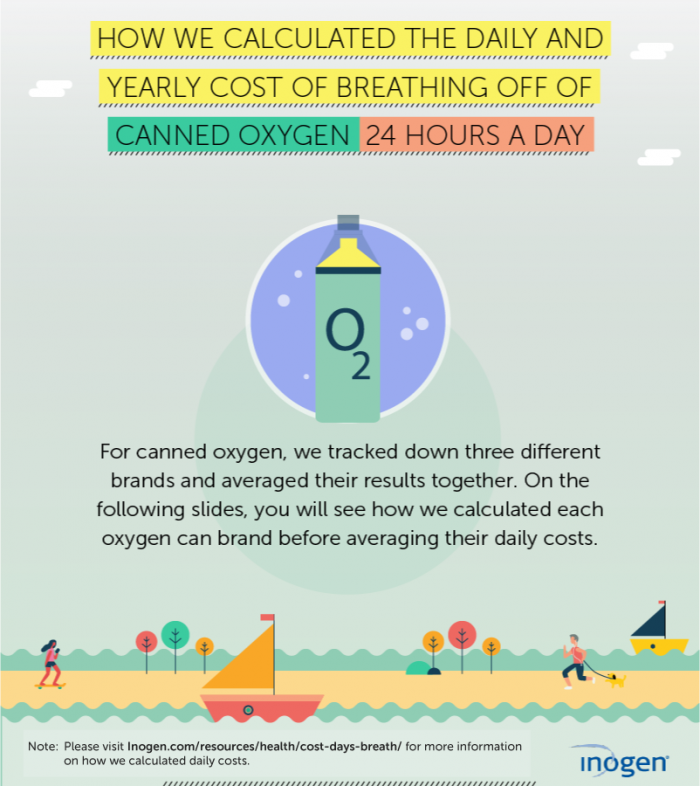 While the concentration of oxygen in canned air is high (95 percent), the cost is even higher. There are many things you can do at a bar – go on a date, enjoy a meal, or just hang out with friends. But what about an oxygen bar? Since the late ’90s, Americans have been able to spend a few minutes of their day breathing in oxygen flavored like anything from peppermints to cranberries. While the oxygen therapy used for COPD and similar conditions often requires a prescription from a doctor, an oxygen bar is meant purely for recreational use and makes no medical claims about its effects. Still, that doesn’t stop people from believing it might help with their headaches, concentration, and energy levels. In reality, there can be more harm than good caused by the oxygen Americans breathe in at oxygen bars, especially when it’s flavored. Most Americans aren’t investing in the equipment when they go to an oxygen bar, but they are paying for their sessions. If they needed that oxygen all day, they’d be paying quite a bit. The per-day cost would amount to more than $1,400, and the annual cost would exceed $525,000 – far more than the cost of using an oxygen concentrator like the Inogen One G4. Here you can explore the information we used to gather each oxygen suppliers’ equipment and daily costs. This data included the cost of required accessories, as well as refill costs where applicable. By breaking down the cost per day, we were able to multiply that figure by 365 days to extrapolate the annual costs of each device or service. Each of these figures represents an average based on our research as described by the graphics above. Imagine going outside and feeling a tightness in your chest or a wheezing cough that just won’t go away. For the millions of Americans with conditions like COPD, this is a reality. For COPD and other conditions that impact the ability to breathe like pneumonia, severe asthma, cystic fibrosis, or even sleep-related breathing conditions, oxygen therapy may be able to help. If you or someone you love has a chronic breathing condition, portable oxygen concentrators may be the solution you need for better breathing. By increasing exercise tolerance, improving mental alertness, stamina, and mood, portable oxygen from Inogen gives you the freedom to live your best life, wherever you are. Don’t let breathing issues take over your life. Visit our product page to learn more. Oxygen is something most of us take for granted. If you were impacted by the information presented on this page, feel free to share it for noncommercial use only. Please just provide readers with a link back to this page.